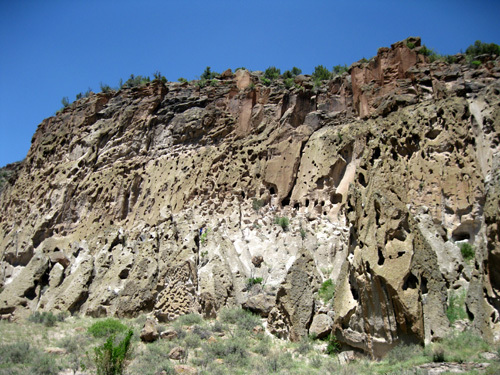 "Tuff -- consolidated volcanic ash that forms Bandelier's cliffs and canyons. " I like the play on words, "tuff times." 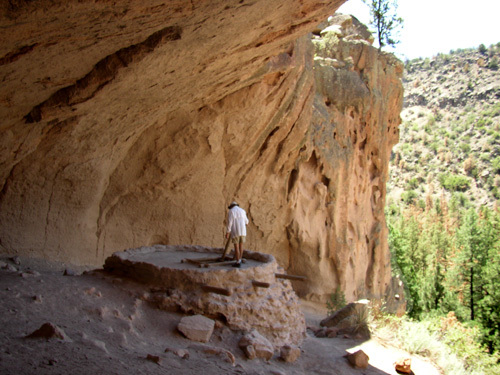 Not only does it accurately describe the difficult times ancestral Pueblo peoples and their hunter-gatherer predecessors had in order to survive in northern New Mexico's high desert terrain for over 10,000 years, it also describes the soft, crumbly rock they used in more recent centuries to make their dwellings. 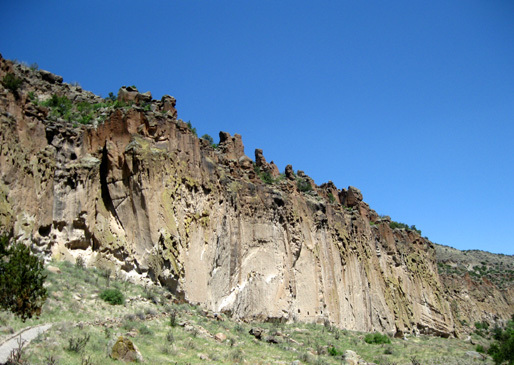 In the last entry I talked about the two cataclysmic volcanic eruptions that formed the canyons and mesas of the Pajarito (pa-ha-REE-toe) Plateau over a million years ago. As reference, scientists say that each of the two Jemez (HAY-mess) eruptions was 600X more powerful than the 1980 eruption of Mount St. Helens. Enough volcanic ash was ejected from the epicenter at Valles Caldera to cover an area of 400 square miles up to 1,000 feet thick. That's a lot of ash! 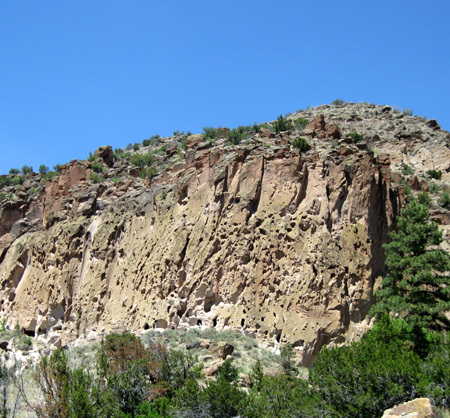 Most of the ancient stone houses and cave dwellings at Bandelier National Monument are concentrated in Frijoles (free-HOH-lace) Canyon. The pink canyon walls are volcanic ash that packed down over time into the soft, workable rock called "tuff." Softer areas of the rock weathered naturally over centuries into caves and the Swiss-cheese appearance (below) we still see today. 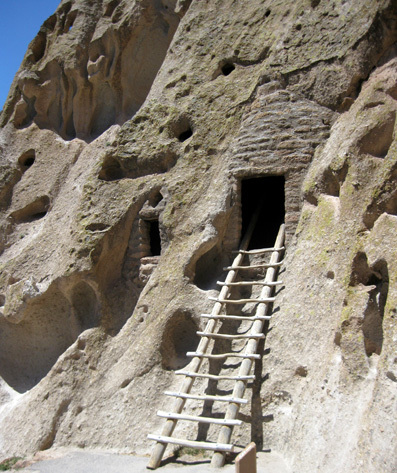 Native Pueblo people enlarged some of those caves for shelter and storage and cut blocks of tuff to build extensive, above-ground masonry complexes in which to live. Frijoles Canyon is a small part of the extensive area in New Mexico, Colorado, Utah, and Arizona that was inhabited by ancestral Puebloans. 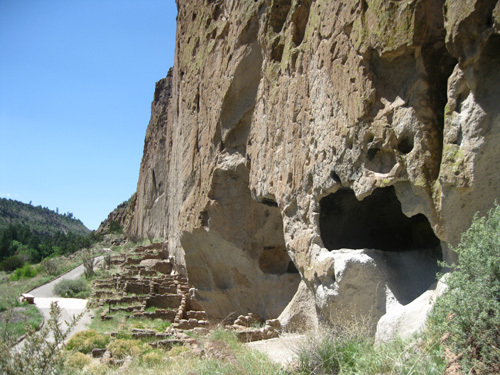 Bandelier National Monument and the nearby Tsankawi Unit are but two locations where visitors can see some of their ancient dwellings, learn more about their interesting culture, and marvel at how they survived such tough times from approximately 1100 to 1600 CE (Common Era). Six years ago Jim and I visited Santa Fe, Los Alamos, and Bandelier National Monument but my memory of that trip is vague. For one reason, I seem to have selective CRS Syndrome. For another, I didn't take as many pictures then as now. That was the first year we had a digital camera (all of three megapixels!) but I was still in "film" mode mentally and didn't realize I could take a gigundus amount of photos digitally and not run out of film. I learned pretty quickly, though, and now I've done a 180 and take tons of pictures. What a need to learn next is to delete more shots when I'm editing them. Funny thing is, on my recent trip to Bandelier and Tsankawi, I DID run out of memory space on my one-G memory card for the first time ever! You knew I took a lot of photos, right?? Well, not that many. It was more quality than quantity that maxed out the card. I forgot to erase all the pictures I'd already downloaded from the previous day's trip down the Jemez Mountain National Scenic Byway. 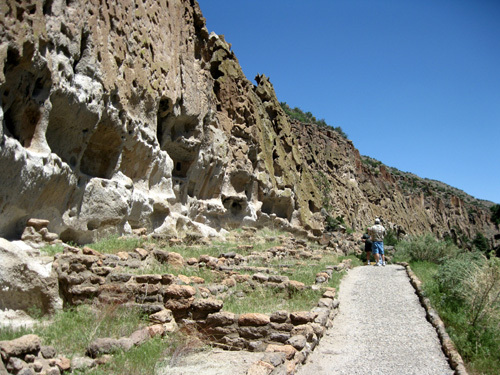 I also didn't realize until I was two-thirds of the way through Bandelier that I had our 10-megapixel Canon Powershot A1000 camera set on its highest resolution both days: 3648x2736 pixels, or enough to print out photos that are 15x20 inches. I'm used to taking several hundred photos at a time on the next lower setting, which is still pretty big, and had no clue I was using up the memory capacity so fast. All of a sudden I saw that I had only 20 shots left. Yikes! There was still a lot to see and photograph! I immediately lowered the size setting but still had only 32 shots left. I became much more selective AND returned to Tsankawi another day to take pictures of some of the things I missed there. 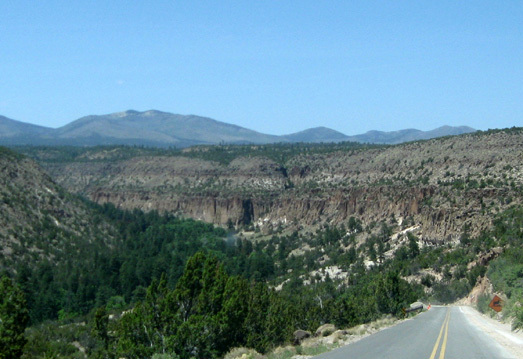 It's only about six miles from our camping location at the south end of Los Alamos. Two more small lessons learned the hard way: always download photos promptly and erase them from the memory card (I usually do that) and be more cognizant of the size setting. Better yet, get a bigger memory card!! They're pretty cheap these days. 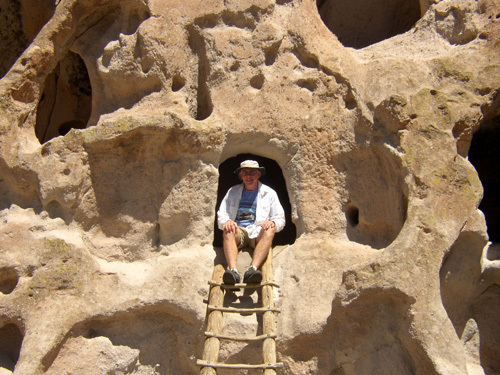 Meanwhile, Jim's memory of Bandelier from six years ago was intact and he didn't want to be climbing ladders and walking around Frijoles Canyon so close to his race. We'd already done some hiking on the trails in Los Alamos' open space that morning and he wanted to rest. I took the opportunity to drive the Route 502-501-4-502 loop (about 40 miles) to explore the two Pueblo ruin sites of Bandelier and Tsankawi by myself that afternoon, finishing up that part of the Scenic Byway. I enjoyed Tsankawi so much I cajoled Jim into going with me the second time. 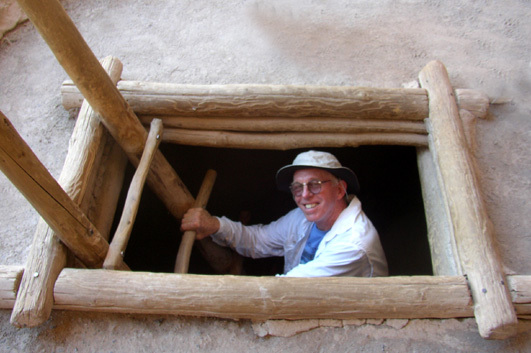 He agreed, since he hadn't seen that unit of Bandelier back in 2003. 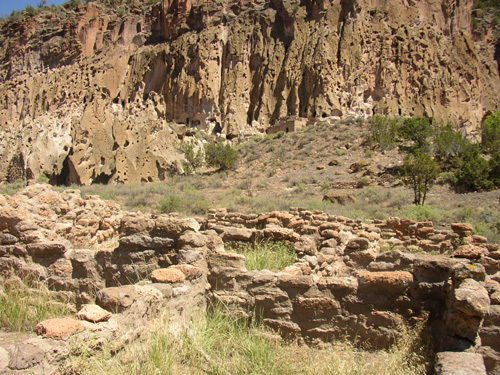 Although the ancestors of modern Pueblo people have lived in this area for thousands of years, the approximate 3,000 dwellings that remain scattered throughout Bandelier National Monument today are primarily ones built between 1100 and 1550 CE. As the population grew over the years, people congregated in larger but fewer groups. Villages that had contained 40 rooms grew to ones with 600 rooms or more. 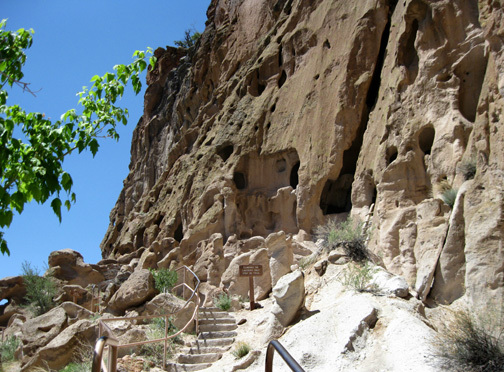 The villages of Tyuonyi (QU-weh-nee) and Tsankawi (SAN-kuh-wee) and their nearby cave dwellings exemplify the latest period of colonization in the units at Bandelier. The road winds down from the mesa to Frijoles Canyon, site of the visitors' center, other buildings, and trailheads to the main ruins. This road, the trails, and most of the other infrastructure at Bandelier were built in the early 1930s by about 200 young men in the Civilian Conservation Corps. 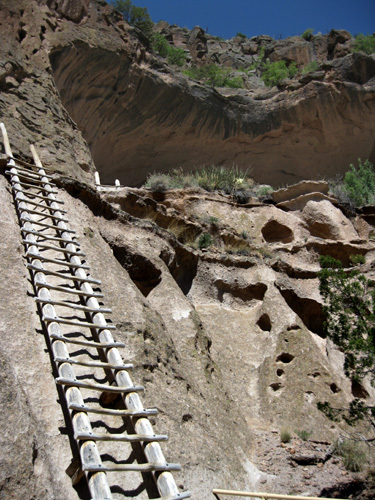 Although pioneering anthropological work by Swiss-born Adolph F. A. Bandelier brought attention to the area in the 1880s, and the monument was officially established by Congress in 1916, the trail into Frijoles Canyon was so steep and difficult that not many people visited until the road was built in 1933. The low stone and wooden Pueblo Revival-style buildings blend into their surroundings quite attractively. 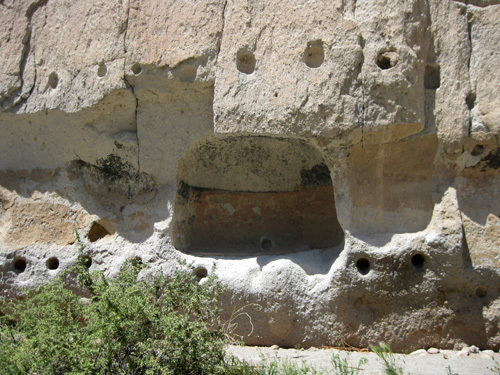 The men in the Bandelier CCC carefully cut and placed each stone, creating a distinctive southwestern style that is unique to the park. You can still see hand-carved furniture and decorative tin light fixtures they made. 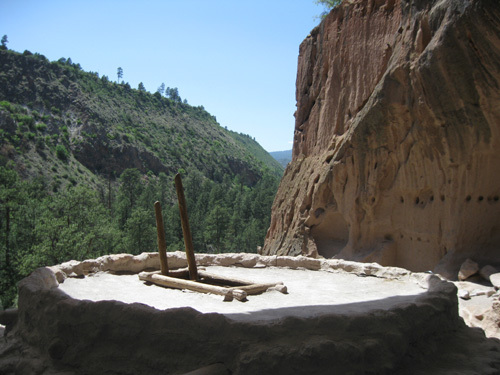 Bandelier has the largest collection of CCC structures, tinware, and furniture in the National Park Service. On your first visit to Bandelier I recommend purchasing the very informative Main Loop Trail guide in the Visitors' Center for a small fee. I had the one we bought in 2003 and used it again; not much has changed. The booklet has a map and very detailed information about everything you'll see on the 1.2-mile loop (or 2.2 miles if you continue on to the Alcove House). Part of the trail is paved but not all of it is wheelchair accessible. 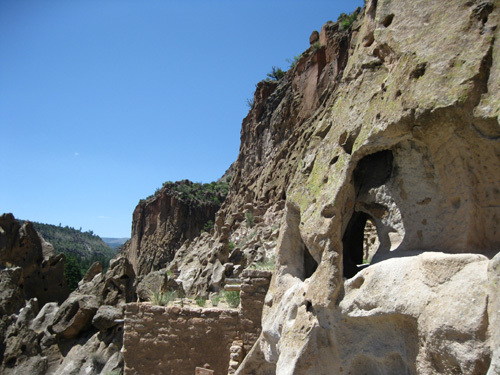 There are steep, narrow trails to all of the cliff dwellings past the large Tyuonyi Pueblo. The trail to Alcove House AKA Ceremonial Cave is pretty flat but not paved. Visitors can see many of the ruins even if they aren't able to climb ladders to peek inside some of the caves. Of course, if you climb the ladders it adds a lot to the fun factor! I didn't know how my deteriorating knees would handle the ladders, especially the 140-foot grind up to the Alcove House, but they did just fine both up and down. 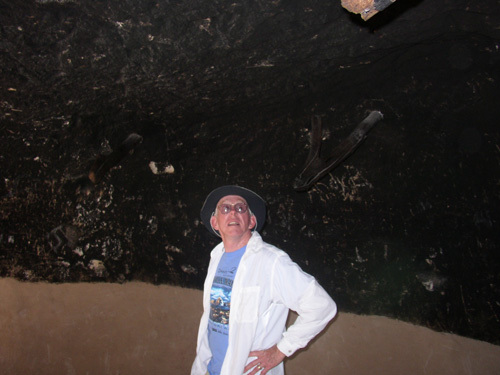 It is major fun to look or walk inside the caves. I'm just glad I don't have to live in any of them! The tuff-block walls of the pueblo remain the same height as when they were excavated. The park service has to occasionally stabilize the fragile stone walls with new mortar to prevent further deterioration. The original residents also had to replace the mud mortar in the walls and the wood used for roofing. 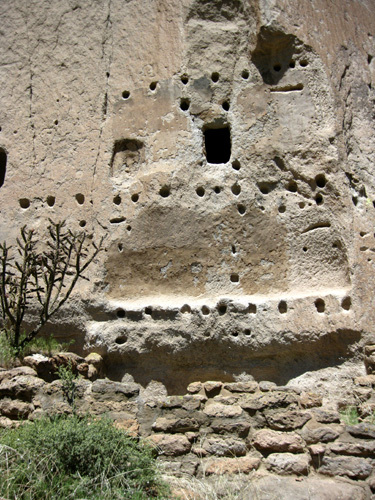 Some of the dwelling sites at Bandelier remain unexcavated, buried for hundreds of years. According to the Main Loop Trail guide, a lot of valuable information was lost or destroyed in the early 1900s when the science of archeology was in its infancy and many of the more sophisticated methods in common use today had not yet been developed. 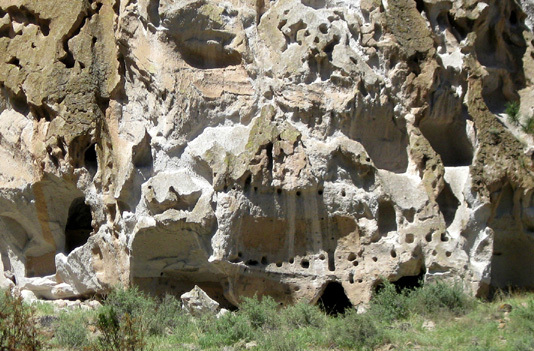 Today the Monument preserves unexcavated sites at Bandelier and Tsankawi for study in future years when even better methods (and perhaps more money) will be available. Two archaeologists were working at the Tyuonyi site under a blue canopy when I visited. You can see the canopy in the view looking down on the village two photos up. 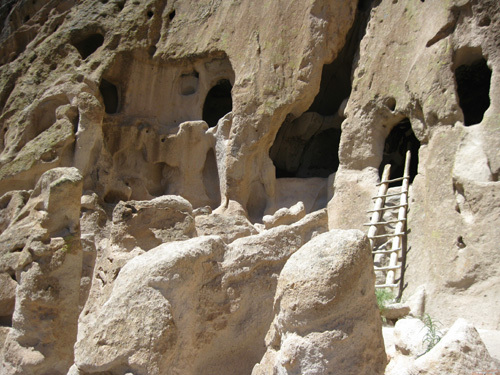 My favorite part of Bandelier comes next on the Main Loop Trail: three different sets if cliff dwellings! 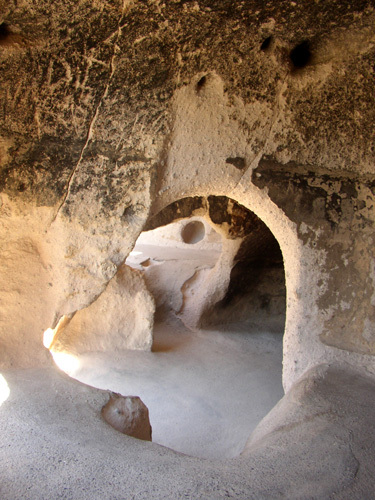 Visitors can climb up into several of the natural caves and carved rooms (cavates) along the cliff above Tyuonyi Village and the Alcove House another mile up the canyon, but not the caves in Long House. Because I don't know which caves were natural and which were carved, I'll just call all of them "caves" for simplification. See the little people and the hand rails? The footing gets trickier up here. 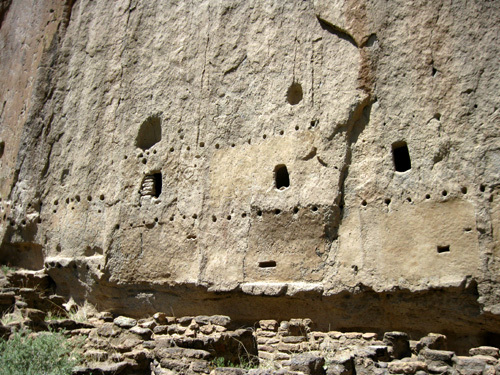 The caves used as homes by the people in Frijoles Canyon are all placed along the south-facing canyon wall. That was important for winter warmth in this high-altitude terrain (about 7,000 feet). Some of the caves were naturally large enough to hold at least one person but many were enlarged the hard and slow way, by hand with stone tools made from basalt and obsidian. I wish I could have seen what it looked like when hundreds of these houses were built at the base of the canyon walls here and at Long House! Wow. Entry into the caves was often tricky for the original residents. You can still see some ancient hand- and foot-holds in the cliff faces. Ladders were necessary to reach some of the rooms, just as they are now. Most of the talus houses along the wall were two or three stories tall. All that remains of them now are low walls, which you can see in several of the photos in this entry. 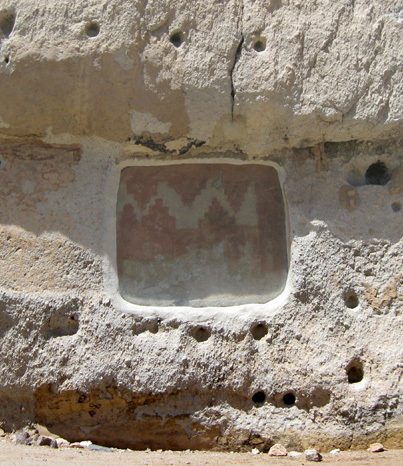 Many cave rooms in the Long House still have their original plaster from 400-500 years ago, such as the darker colored wall in the center of the photo above. The rooms were protected by the talus houses for many years, and also by overhanging cliffs. I have no doubt those two designs are genuine prehistoric art but a few at Tsankawi made me wonder if they were the work of modern pranksters. I presume the park service would cover any grafitti. The rock art at Bandelier and Tsankawi fascinates me. They're the closest thing to a written language during this period of time. Most of the designs have been studied and their original purpose or "message" identified but I don't know what they are. Someday maybe I'll research the meanings more closely. 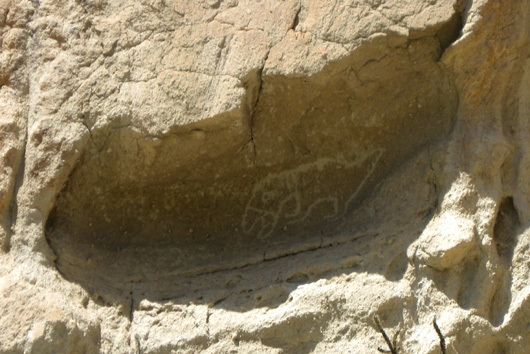 I'll show more pictographs and petroglyphs from Tsankawi in the next entry. 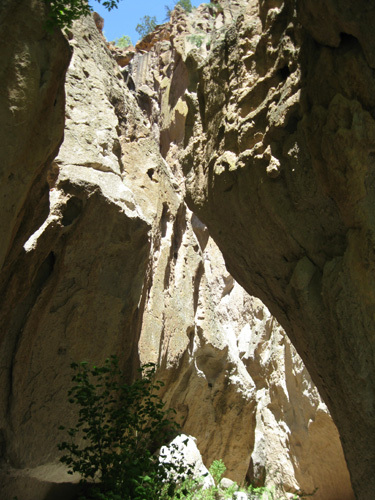 It's well worth the time and effort to take the level, shaded half-mile trail at the far end of the Main Loop Trail and visit this ancient ceremonial cave, another highlight of a visit to Bandelier. 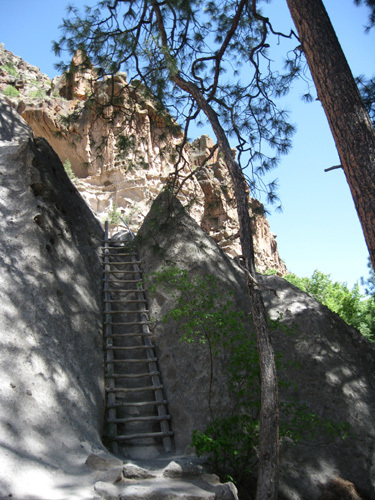 Although the Alcove Trail is level, the park service warns visitors with a fear of heights or physical limitations about the strenuous climb to the cave: 140 feet up steep wooden ladders and stone steps cut into the canyon wall. I was pleased to see how many "older" folks made the climb the day I was there! First ladder at the base: just a warm-up! The last ladder to the top is the longest and steepest. None of the rooms remain inside the alcove now, only a couple of low walls. This was the only place at Bandelier where I ran into anything resembling a "crowd." Most were just sitting around, enjoying the view and/or catching their breath after the big climb, and I didn't want to out-wait them to take more pictures. Otherwise, a sunny weekday May afternoon is a perfect time to visit the park because temperatures are moderate and it isn't too crowded. 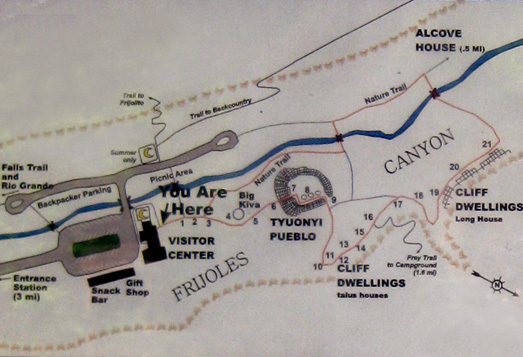 There are several other underground and cave kivas (KEE-vahs) in the canyon. They were used for religious activities and the education of boys and young men. Since these people had no written language at the time, they passed down knowledge from one generation to the next through oral traditions like legends, stories, prayers, and songs. 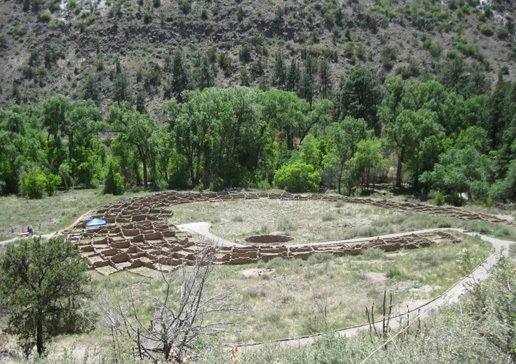 Kivas are sacred sites that are still used by modern Pueblo people. 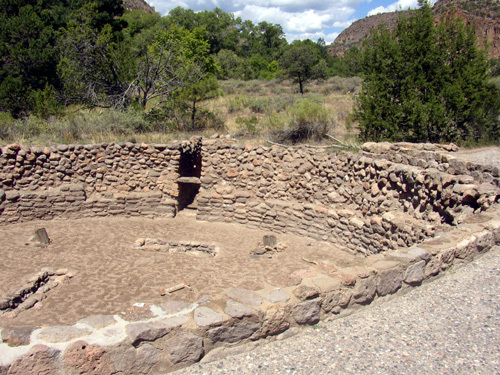 By the mid-1500s the villages in Frijoles Canyon were abandoned, probably because of repeated droughts and the exhaustion of natural resources in the valley. No one knows for sure but there are some likely reasons. The permanent stream which runs through the canyon, El Rito de los Frijoles, may not have been bold enough to provide enough water to irrigate crops for so many people for so long. Up to 500 people once lived in this canyon at a time, with other villages nearby. After 400 years of intense farming, cutting trees for firewood and building, collecting plants, and hunting wild animals, it's likely the land could no longer sustain the population. Those people initially re-settled in villages along the Rio Grande ("Big River") several miles away. 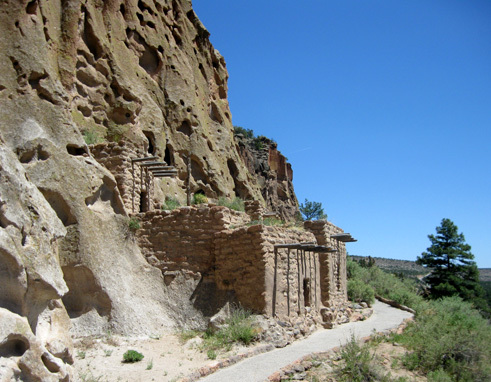 Today there are nineteen Pueblos (villages) in New Mexico, eight of them within 80 miles of Bandelier Park. 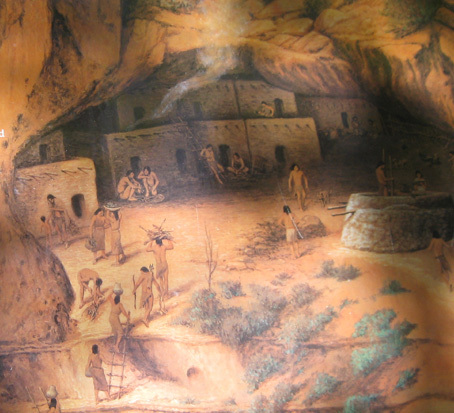 People of the Cochita Pueblo, a little south and east along the Rio Grande, are the most direct descendants of ancestral Pueblo people who lived in Frijoles Canyon. 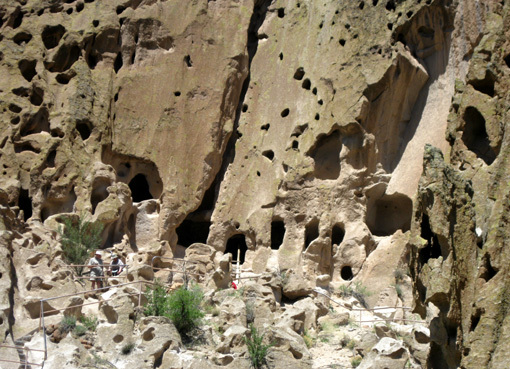 The people of San Ildefonso Pueblo are most closely linked to Tsankawi. Remember, too, that collecting any historic artifacts or disturbing the ruins could land you in jail; those are felony offenses. 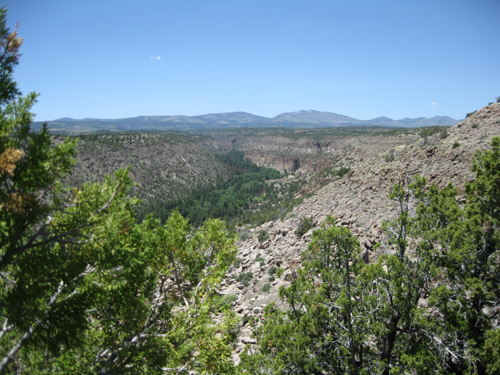 There are other trails from the visitors' center to the upper and lower Frijoles Falls, the Rio Grande River, Juniper Campground, and dozens of miles of backcountry trails. We haven't explored any of those trails yet. This park is huge, 33,750 acres big, and most of it can be seen only on foot. 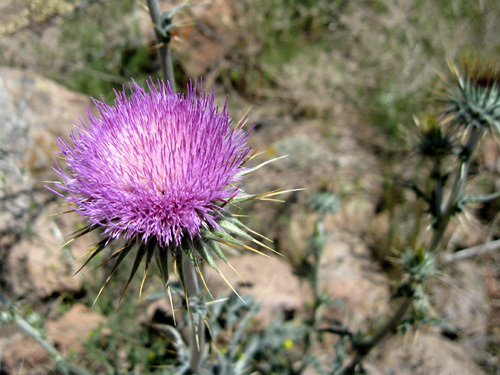 Day hiking and overnight backpacking are allowed with a wilderness permit. Hiking is the only way to see most of the park's wildlife and some of its remote archeological sites, petroglyphs, and pictographs. 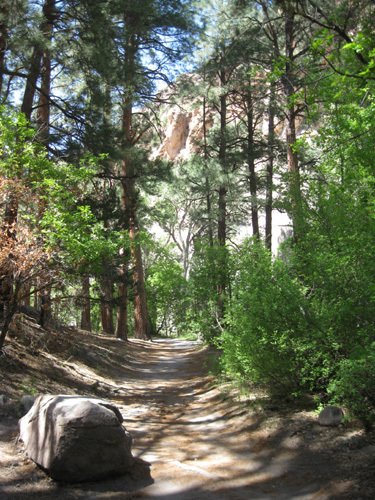 Pets, bicycles, motorized vehicles, and campfires are not allowed on the trails or in the backcountry at Bandelier. Dogs are allowed on leashes only in the parking lot, picnic areas, and campground. 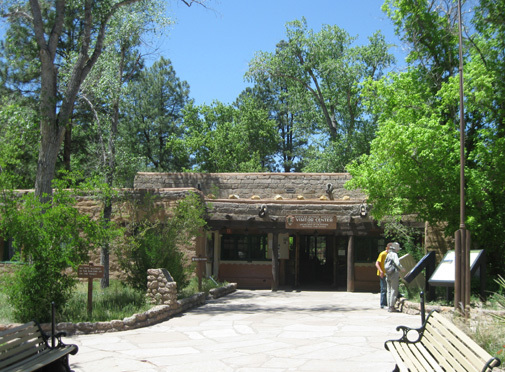 The park entry fee is well worth the cost to see just the exhibits in the visitors' center and the ruins along the Main Loop Trail. Since the pass is good for seven days, however, I highly recommend also visiting the Tsankawi Ruins several miles to the north. That site is completely different. 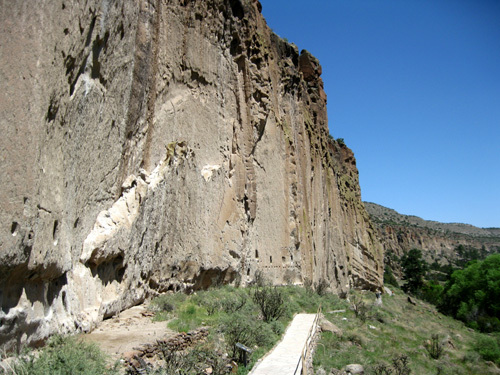 Add in some of the other trails at Bandelier, and you've got some real bang for your bucks!